Screen-based technologies increasingly merge the levels of action and perception. With image production and transmission being possible in real time, screens are no longer spatially fixed and temporally subordinated devices that display static images, but are increasingly integrated into visual practices. The correlation of screen and operation in graphical user interfaces, touchscreens or augmented reality applications, turns the viewer first and foremost into a user. The workshop investigates the relationship of screen and operation in visual culture, interaction and architectural design, computer history, medicine and warfare. 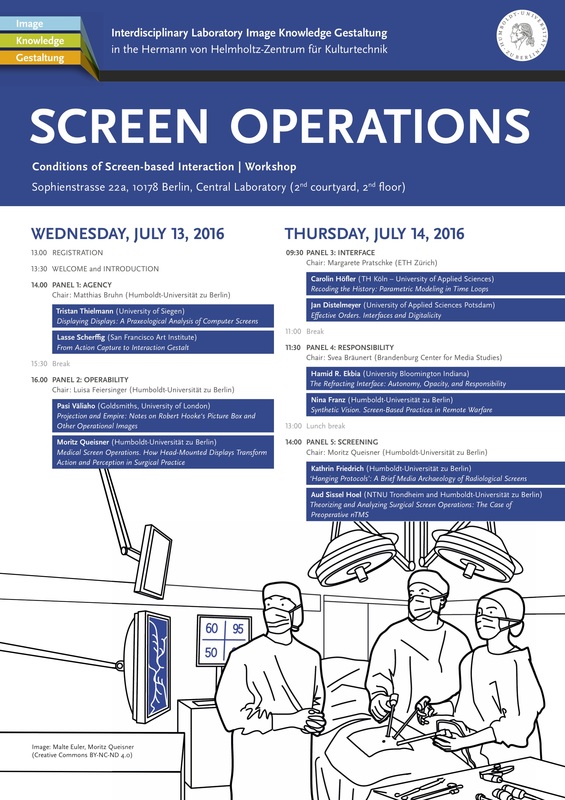 We will discuss the aesthetic, epistemic and operational modalities of screen operations in order to trace their political, technological and historical implications. Download program with abstracts here (PDF).